Canadian homeowners renewing their mortgages will get something of a “reprieve” for the rest of this year. It’s next year that’s going to really hurt, Bank of Montreal warns. This comes as Canada’s housing markets, particularly in the Toronto and Vancouver regions, are already adjusting to new measures. BMO senior economist Robert Kavcic recently crunched numbers pointing to what he called a “sea change” in the mortgage market as rates rise. “For the first time in about 10 years, homeowners coming off five-year fixed-rate terms in Q1 were facing market rates a touch higher than those taken out at origination,” Mr. Kavcic said. “And, after some reprieve through the rest of this year, this rate-reset amount is poised to rise more meaningfully by early 2019 (recall that five years prior, rates were plunging in the wake of the oil shock),” he added in his report. That won’t smash the economy, Mr. Kavcic said, but it does mean the party’s over. The rise in mortgage rates, and other borrowing costs down the road, could eat into consumer spending, which has helped bring Canada’s economy through some troubled times. Mr. Kavcic’s colleague, BMO Canadian rates and macro strategist Benjamin Reitzes, has also crunched some numbers on that front, warning that swollen consumer debt levels and “a greater sensitivity to rate hikes” will continue to be an issue, for households and the Bank of Canada alike. “Running the numbers shows that debt-service costs would rise by about $5-billion annually for every 25 -basis-point increase in average interest costs (not overnight rates),” Mr. Reitzes said. Affordability is, of course, a huge issue in Canada, particularly in Vancouver and Toronto, and became even worse in the first quarter, National Bank economists said in their latest measure last week. The Vancouver market is the least affordable since 1980, the bank said, while the Toronto area is “very expensive” by historical norms. “First- time buyers can turn to condos, but even there the price of ownership is $500,000,” National Bank said. On a national basis, a mortgage payment in the study’s representative home, expressed as a percentage of median income, rose 1.2 percentage points in the first quarter. “Over the last three quarters, the rise of interest rates has further reduced the affordability of Canadian housing, especially in Toronto and Vancouver,” National Bank said. As BMO’s Mr. Kavcic put it, a decade of “persistent mortgage renewal windfalls” is over. Bombardier Inc. struck a deal to sell a minimum of 30 C Series airliners to Air Baltic Corporation, lifting hopes for the aircraft program ahead of its planned takeover by Airbus SE, The Globe and Mail’s Nicolas Van Praet reports. The European carrier has put in a firm order for 30 larger CS300 planes with options and purchase rights on another 30 aircraft, Bombardier said in a statement Monday. The sale is worth US$2.9-billion based on the list price of the aircraft though discounts are common. The agreement marks a vote of confidence in the C Series from an early customer. Bank of Montreal and online bank Simplii Financial are both warning customers that “fraudsters” claim to have accessed personal and account information belonging to tens of thousands of customers through apparent data breaches, The Globe and Mail’s James Bradshaw reports. BMO said it was contacted Sunday by the alleged perpetrators, who claim to have sensitive information belonging to “a limited number of customers,” according to a statement released Monday. From housing to trade to the broader economy, there’s more than enough uncertainty to stay Stephen Poloz’s hand this week. The Bank of Canada governor, senior deputy governor Carolyn Wilkins and their colleagues are expected to hold their benchmark overnight rate steady at 1.25 per cent Wednesday, choosing to wait until July, at the earliest, to begin tightening again. “With much uncertainty remaining and a third consecutive quarter of soft growth, we anticipate the BoC will hold policy rates steady,” said Benjamin Reitzes, Bank of Montreal’s Canadian rates and macro strategist. Canada’s economy has downshifted, and Statistics Canada will highlight this Thursday, a day after the central bank decision, with a look at first-quarter growth. Economists expect that reading to show gross domestic product expanded at a soft annual pace of between 1.5 and 2 per cent. “We now look for an even 2-per-cent real GDP pace, which nicely tops the last BoC projection,” said CIBC World Markets chief economist Avery Shenfeld. Of course, Mr. Shenfeld’s projection is on the high side of the range. Royal Bank of Canada economists, for example, expect to see 1.8 per cent, which, they noted, would be half of a percentage point above the central bank’s forecast of 1.3 per cent. That “would still mark a third straight quarter of growth at or slightly below the 1.8 per cent the bank estimates as the economy’s underlying ‘potential’ growth rate,” RBC said. All in all, RBC and other observers expect the central bank to signal an increase in its key rate, but with no stated timeline. Already, Canadian, American and Mexican negotiators have missed a so-called congressional deadline to strike a new North American free-trade agreement. And the central bank has already flagged NAFTA as a key uncertainty, and now come added threats of tariffs on a few fronts. First, there’s President Donald Trump’s latest threat, a tariff of up to 25 per cent on auto imports, after his administration launched a probe under national security provisions. Then there’s the fact that the exemption from U.S. tariffs on steel and aluminum runs out on Friday, and “a rate hike just days before tariffs could be imposed would look quite bad,” said BMO’s Mr. Reitzes. Mr. Trump threatens a lot of things, of course, but even a bark adds to uncertainty whether or not it’s followed by a bite. “President Trump’s latest threat may ultimately prove to be another negotiating tactic in the ongoing NAFTA saga, particularly since such a visible price increase is unlikely to be popular among voters,” said Toronto-Dominion Bank senior economist Brian DePratto. “But, it adds yet another challenge to already difficult negotiations,” he added. Home sales have tumbled in the wake of provincial government measures to cool off the Vancouver and Toronto area markets and, most recently, new mortgage-qualification rules from Canada’s commercial bank regulator. Mortgage rates have also increased, adding even more pressure. “With sales yet to stabilize, it’s hard to imagine the BoC will opt to tighten policy further and increase the downside risk to housing,” Mr. Reitzes said in a lookahead to the rate decision. Indeed, Canadians have been walking a fine line, having driven up home prices and borrowing to finance that. Thus, the Bank of Canada’s balancing act. “Perhaps what is most on the bank’s mind is the gargantuan debt load that the Canadian household sector carries on its balance sheet,” said David Rosenberg, chief economist at Gluskin Sheff + Associates. “It’s like a ball and chain that can really only be serviced adequately out of current incomes if rates stay low,” he added. It will be a slow start to the week, given U.S. markets are closed for Memorial Day. But watch for how other exchanges fare after Europe’s losses last week on political concerns in Italy, with Canadian stocks also down, though by less than 0.5 per cent. “As U.S. indices are searching for direction, still consolidating after the early-year blowout and subsequent correction, we’re all acutely aware that the S&P 500 is closing in on the longest post-war bull market on record, now more than nine years old and within shouting distance of that laid down through the 1990s,” said BMO senior economist Robert Kavcic. Here’s where it picks up, with Bank of Nova Scotia, CannaRoyalty Corp., Indigo Books & Music Inc. and others releasing quarterly results. Markets will also get the latest reading on U.S. home prices. 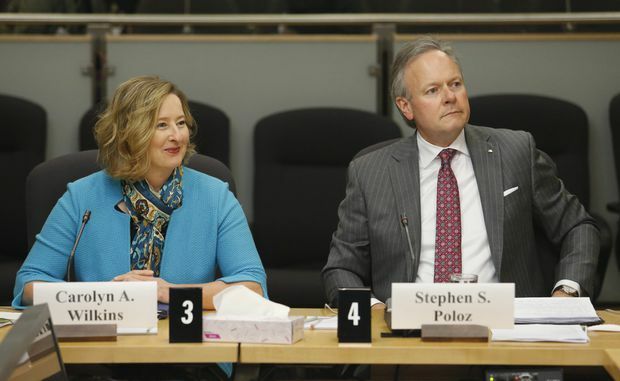 Before Mr. Poloz and his colleagues take the stage, Statistics Canada will lay some groundwork with its first-quarter measure of the current account balance. Economists expect we’ll see a fatter deficit of $18-billion or more, an increase of almost $2-billion. “Transportation bottlenecks were largely to blame for a slowdown in goods exports, while firming domestic demand later in the quarter supported healthy growth in imports,” said Royce Mendes of CIBC. The day also brings quarterly results from BMO and National Bank of Canada. Plus, the Federal Reserve’s Beige Book of regional economic conditions, the first of two reports this week that may suggest where the U.S. central bank is headed. The GDP report may, as noted, highlight a weak first quarter, but economists believe the first three months were weighed down by January, and that the March showing will be better, and point to stronger days ahead. “The Canadian economy woke up in 2018 with a bit of a hangover,” said CIBC’s Mr. Mendes. “But, after a brief decline in January, economic activity appears to have perked back up,” he added. On the earnings front, watch for Lululemon Athletica Inc. and Costco Wholesale Corp.
Overseas, watch for what Capital Economics says will be higher inflation in Europe, and unemployment holding at 8.5 per cent. India, meanwhile, is expected to report first-quarter economic growth of 7.5 per cent from a year earlier, a pickup from the fourth-quarter pace of 7.2 per cent, “with the strength of industrial production growth, various consumer indicators and soft survey data in Q1 all suggesting that underlying conditions have improved,” said Shilan Shah of Capital Economics. Consider it akin to the Fed getting its ducks in a row as it heads into its mid-June meeting. After Wednesday’s release of the Beige Book, markets will weigh whether Friday’s U.S. jobs report will nudge the U.S. central bank into another rate hike soon. Economists expect to see May job creation of between 180,000 and 200,000 positions, with unemployment holding at 3.9 per cent. “We expect a strong U.S. employment report to keep the Fed on track for a June hike,” Capital Economics said. Also expected are manufacturing purchasing managers index readings from across the globe, which will add to the economic picture. Editor’s note: An earlier version of this article incorrectly said the central bank would likely get an early look at the Q1 GDP data when it makes its rate announcement on Wednesday, according to CIBC World Markets chief economist Avery Shenfeld. In fact, Mr. Shenfeld said later that the Governing Council of the Bank of Canada is not among the select group of Ottawa officials that get an advance look at the GDP data.